New Dell Inspiron 15 7000 Series (7560) Battery comes in discharged/ partially charged state and it should go through 2-3 charge/ discharge cycles to achieve its optimum efficiency. 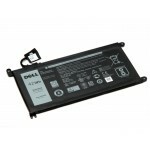 When charging a new Dell Inspiron 15 7560 Laptop Battery your computer power meter may indicate that charging is complete after a few minutes, don’t worry about it and just remove the battery and install it again and repeat the charging procedure. Dell Inspiron 15 7560 Battery Replacement requires some technical skills to install it and user can either install it or hire a technician to do it. Please refer DIY (Do-It-Yourself) videos available on Youtube for your convenience. It is important to fully charge and fully discharge rechargeable laptop batteries after every 2 weeks, failing to do so may decrease Dell Inspiron 15 7560 Battery Life. Dell Inspiron 15 7560 Battery Backup will be the same as you received in a new laptop because this battery has same specifications. If your Dell Inspiron 15 7560 Battery not charging then please try a different charger to verify because this problem may occur due to a faulty charger also. If Dell Inspiron 15 (7560) Laptop Battery will not be in use for a long time then it is recommended that you should remove it from the device and store it in a cool, dry and clean place. How to Remove and Replace Dell Inspiron 15 7560 P61F Laptop Battery ? Step 1: Unscrew eight (M2.5 x 5mm) screws to remove bottom base. Step 2: Disconnect the battery cable from motherboard. Step 3: Peel the tape gently that secures hard drive cable to the battery. Step 4: Open the latch and disconnect the hard drive cable from the motherboard. Step 7: Press and hold power button for 5 seconds to discharge residual current from motherboard. Step 8: Align the four screw holes on the NEW Battery with the screw holes on the palmrest and keyboard assembly and tighten these four (M2 x 3mm) screws that secure the battery with palmrest and keyboard assembly. Step 9: Slide the hard drive cable into the connector on the system board and close the latch to secure the hard drive cable. Step 10: Apply the tape to secure the hard drive cable with the battery body. Step 11: Connect the battery cable to the system board.